I've mentioned before that I come from a family of crafty ladies both past and present. My cousin, Staci, is no exception. Her current obsession is quilting. 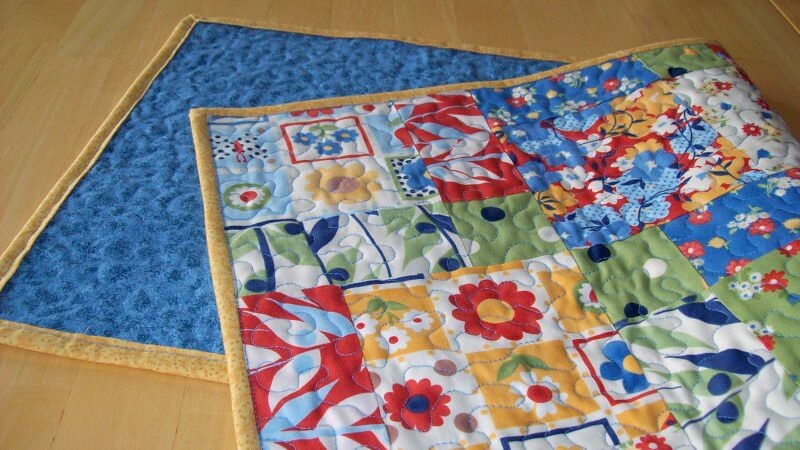 Quilted table runners to be exact, which she sells on her Etsy shop: The Organ Grinder's Wares. Of course she is also whipping up the occasional tree skirt or quilt-along quilt because really, what good is an obsession if you don't go a little overboard right? I am fortunate enough to own one of Staci's table runners. It is a charming accent to my table that makes me happy each time I look at it. I don't have to worry about it hanging evenly on all sides of the table (curse you tablecloths for torturing me when I helped decorate for weddings, I am forever scarred). And the colors are perfect and somehow blend perfectly into every season. But one of my favorite things about Staci's table runners is that fact that she sews them on our grandmother's old sewing machine. While so many old sewing machines are sitting in corners collecting dust our grandma's million-pound Bernina is still clunking away and turning out gorgeous work with the help of Staci's eye for color and steady hands. Staci has kindly offered one of her table runners to one Narrating Life reader. This particular runner is called Happy Holidaisy. How cute is that? The colors are bright and fun and as Staci says, "perfect for someone who needs a burst of sunshine this holiday season." :: Take a look at the cute Halloween table runners Staci has in her Etsy shop. Be sure to bookmark her shop as she will be updating it soon! :: Leave a comment on this post: What is your favorite way to dress up a table? Table cloth? Cloth napkins? Butcher paper? Do tell. :: Grab the Handmade Holiday button and post it on your blog or website for an extra entry! Please leave an additional comment letting me know you did so. Congratulations Sarah! Please email me ASAP to claim your table runner! Our favorite way to dress up a table quickly is to throw on a tablecloth. The table is the hub of our house where everything takes place so tableclothes are nice and quick cover-ups. Cloth napkins and using the 'good' china once or twice a year is definitely as good as our table gets. But I always love a good centerpiece, and this table runner would be just the start. it's lovely! Dress up a table? Ours has a glass top, so the best way to accomplish that is to clean it off. But on really fancy occasions we use a table cloth. I could really use some other options. This runner is SO cute! I love using pretty placemats and chargers. And flowers always finish things off nicely. I am not a fan of table clothes either... to hard to keep even. I like to use placemats and some sort of flowers or center piece. I love her tablerunners! I love the holidaisy! I'm a table runner or placemat kind of gal. Not big on the table cloths. Love chargers and centerpieces. This runner is so fun and cheery! I like to use nature to dress up a table during the holiday season. Pine boughs, pine cones, small pumpkins and gourds, ribbon and candles. I love to make place cards for each person at the table, it helps with the confusion of where we should sit and it looks cute too. Cute table runner! I love cloth napkins. They always add class to dinner! I like to use placemats and a center piece. I LOVE anything quilted! I love to dress my table with home made placemats, table cloth, table runners... whatever mood I'm in. Thanks for the chance to win this terrific giveaway!! 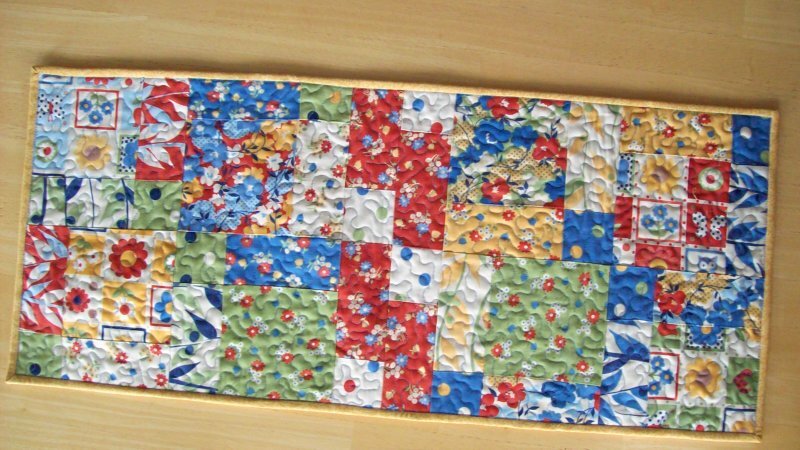 I tend to use table cloths and placemats, but I would love to have a runner! Cloth napkins all the way to dress up my table! (Better for the environment than paper anyway, my kids even take cloth napkins in their school lunch.) These table runners would brighten up any table for sure! While I love the look of a wood table, I generally have it covered for meals with a tablecloth. The table runner is beautiful - thanks for the giveaway! I commandeered our table for my craft area...so my favorite way to dress a table is with a sewing machine, apparently. When we used it as a dinner table I like fresh flowers. Tablecloths are most definitely my weakness. Fresh flowers are also a favorite, although not as lasting. This runner would be perfect in my kitchen! 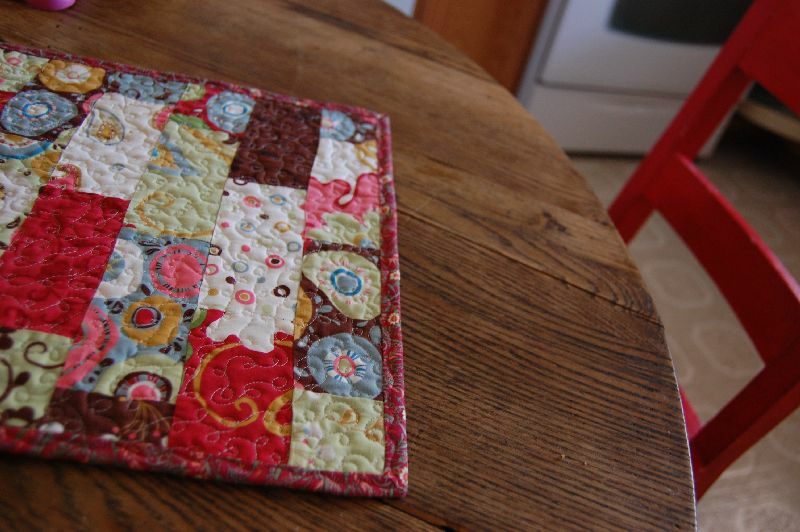 I like using pieces of Fiestaware and an Ikea table runner. Obviously I'm super fancy. hmmm, i never really dress up my table, but i really love vintage cloth napkins. I like to dress up a table with a vase full of marbles or stones and fake flowers... You can change them with the season and they make me happy! lace. Also by decorating with items from the yard; in summer, fresh cut flowers, all sorts; fall, beautifully fallen leaves and acorns; in winter, we put tree branches in a canning jar filled with beans and decorate the branches with gumdrops to add some color pizazz; and in the spring, we fill decorated baby food jars with birds feathers we collect on walks. Thank you for sharing your beautiful work of art! I love to use flowers, fresh or fake, and leaves now that they are changing colors. I think the best way to dress up my table currently would be to remove the computer. Bah. But I do love myself a good centerpiece! These runners are darling!